Italians are one of the liveliest and most cheerful nations in the world who just love and know how to party, that's why Italian culture abounds in different holidays. Apart from traditional celebrations like Christmas, Easter, and St. Valentines Day, which are popular in many countries, Italy has some unique customs and festive days typical only for this part of the world. Let's take a closer look at least some of them. Christmas holidays in Italy end with Epiphany, celebrated on January 6th throughout the country. The main symbol of the day is Befana, a Santa Claus-like figure, who looks like an old benevolent witch, wearing old clothes and flying on a broomstick. In part she is like Santa, flying down chimneys to present gifts and candies to children. As it's the twelfth day of Christmas, there exists a proverb "L'Epifania tutte le feste le porta via" which literally means that Befana takes all the holidays away. If you are a pizza lover, come to Campania at the beginning of June. Every year the motherland of pizza, Naples, holds the main pizza festival in the world and one of the brightest events in Italy. The festival lasts a little more than a week when Naples fills with the magical aromas of basil, mozzarella, and freshly baked pizza. This sunny southern city becomes a place of pilgrimage for all fans of this famous Italian dish. On June 2nd all Italians recall the important events of 1946 and celebrate the Republic Day or Festa della Repubblica Italiana. This day marked the birth of a new regime as Italy ceased to be a monarchy and adopted the republican system of government. Traditionally, the day is celebrated with military parades and festive activities that take place all over the country. Natale di Roma or the Day of Rome is an Italian holiday, not a public day-off, but often lasting for 3-4 days. The celebration starts with the symbolic opening of the city gate. If you want to wish Rome a happy birthday, come to the Eternal City on the 21st of April. One of the most popular activities of the day is the festive historic procession, which anyone can take part in, wearing a traditional costume. The whole procession is lead by the Goddess of Rome, selected at the annual competition, organized since 2004. It's only the beginning of endless carnival locations in Italy. However, the most famous one takes place, of course, in Venice. 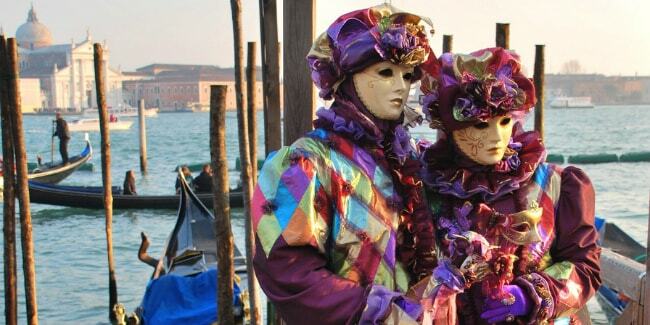 Every year in the midst of winter Venice becomes a carnival stage for three weeks! During this time performances take place at almost every corner - on the streets, in famous museums, theaters, and palaces. It is certain that this is the event that one should take part in at least once in a lifetime. Every year Italians and tourists from all over the world come to an ancient Italian town of Ivrea to take part in the spectacular costume festival, the Carnevale d'Ivrea, that is accompanied by traditional orange fights, when you can "play snowballs" with oranges. Сolorful festivals, held before Lent, are a good tradition in many countries of Europe and Italy is no exception. So if you don't mind participating in such a juicy festive event, plan your Italian tour in late February - early March.